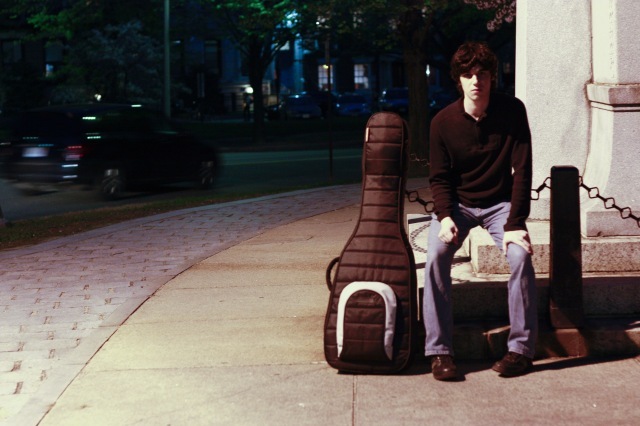 Andrew Sheron is a multi-instrumentalist from Brooklyn, NY who refuses to be bogged down by genre constraints. What do I mean? Sheron’s nine-song debut release Travelling Time which he released with his band Everyman of Parts is an excellent example of musical diversity. I cannot label it because each song has its own distinctive flavoring. The album is like a layered dip – you scoop the concoction up with a chip and, is that guacomole? Travelling Time , which can be streamed in full for free on Everyman of Parts’ bandcamp (click Travelling Time), features a wide gamut of influences. We move from conventional folk to funk to alternative metal to classic rock to jazzy piano. When an artist attempts to tackle so many influences in nine songs the result is usually disastrous, but Sheron and his band delicately interweave these influences back-to-back so listeners are able to follow along and enjoy the music. The best way to review an album like this is to just get to the music. The curious bunch has already clicked on the link above and are listening to some of the songs. If you haven’t, no worries, I am going to highlight a few tracks from the album that I am enjoying on my first listen. Before I get to this, some long-time readers of the Music Court may recognize the last name Sheron. You are not losing your mind. He is related to Daniel Sheron of Balto who we featured way back in April of 2011 (okay not really way back). You can read that post here. Now let’s move on with the show. We are starting with an upbeat tune called “Display Case” that infuses indie sensibilities with pure funk. I think the funky, skillful guitar is well done by Sheron. The piano, which is also played by him, carries this 60’s Hammond organ theme that I not only enjoy, but also respect. I love tangible hearing classic rock influences in modern music. The backing horns in the culminating choruses are excellent – credit to Joseph Peterson – Trombone and Marc Plotkin – Alto Saxophone as well as the horn arrangers Anne H. Goldberg and Sheron himself. This is a treat. “Are you Cold” begins with a simple Cat Stevens’-like acoustic guitar riff. This song features Sheron’s voice which is smooth, tender, and emotional. He is clear and concise. The lyrics are able to shine through and gems like the lyric, “I wonder if she’s beautiful to me because she’s frail, and if under her distrust and pain I’ll find my holy grail,” shine. The song rises with strings and bravo to Christopher Marion – Strings & String Arrangements – the strings are perfect, especially the end. The harmony that creeps into the song before Andrew Sheron’s awesome falsetto is wonderful. The song is itself a beautiful portrayal of insecurity. I am bouncing between tracks. This is track three on the album and, wow, a bit of a difference right. This was what I labeled alternative metal. It seriously sounds like Rage Against the Machine. And it is so unexpected. The grunginess in the vocal is actually well done. There is an interesting harmony that meshes well with the highlighted blues. There is also a wall of sound effect that the heavy guitar and drums (excellent in every song – kudos to Alex Raderman) fosters. The last song on the album, “The End of the Rope” is my favorite. There is an obvious soberness to the sound but that does not mean that the song is downright lachrymose and depressing. No. I feel that it is more just an introduction to the neat jazzy part that you are about to experience. Wait for it. Yes, there is the piano. Sheron is a great musician. This airy solo features so many influences. There is an element of bassy grunge, acoustic folk, jazzy piano, and vocal honest. It is a perfect close to an excellent debut release.